I've recently adapted the idea of a minimalist lifestyle into my living environment, on top of my clothing style—everything from my room, the living room, to my cube at work. Basically, declutter. If I don't use it daily, it's stored in a drawer or somewhere in a closet. For me, a cluttered area emphasizes a cluttered mind. When I'm stressed or have a lot on my mind, coming home to a super simple space totally puts me at ease. If my space were chaotic & stuffy, it'd only make my stress worsen. On top of that, it makes cleaning my room SO EASY. I legit just have to tidy up, dust everything, vacuum, & I'm done. Obviously, everything is from Ikea because it's the greatest place in all of life. I bought everything when I was apartment shopping for grad school (which I ended up leaving after 3 weeks...) so I had to shop on budget—meaning I needed to pick the least expensive pieces. Thankfully that didn't compromise the aesthetic I wanted, I was able to find everything in natural wood—the bed frame, side tables, & dresser. I've been wanting to paint all the wood white but I don't like how wood looks with paint over it. Just recently though, I discovered this thing called "wood glaze" where it doesn't completely cover the wood in a thick paint—rather it lightly dyes the wood whatever color you choose while still maintaining the wood texture. The more layers you paint, the deeper the color. I found white glaze at Ikea & I've painted most pieces, just haven't had time to get to the dresser. 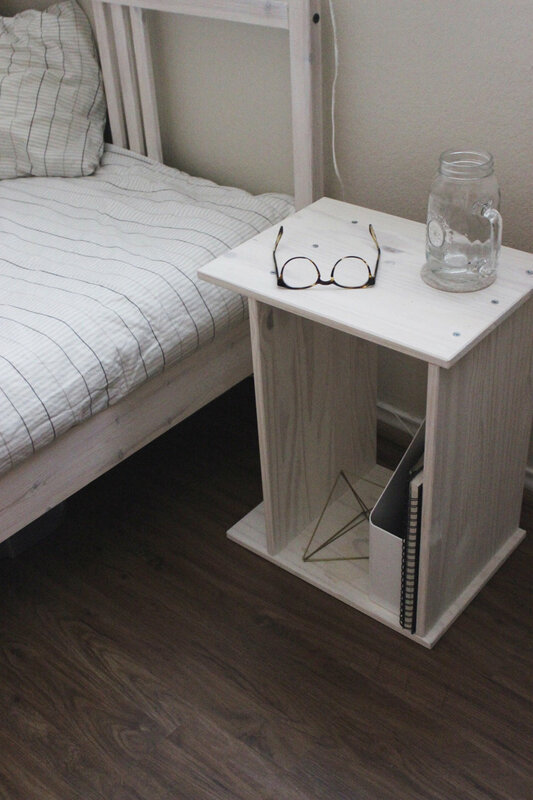 My side tables are actually supposed to be horizontally long, that's why one side of the wood pieces are longer. But when I was moving furniture, I put it on it's side & thought it was way more convenient standing on it's smaller side. What If You Could Only Talk to God On Tuesdays?